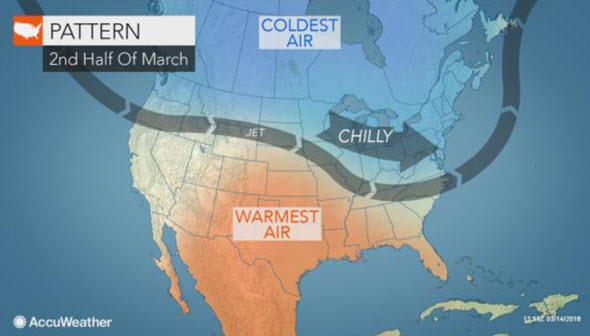 AccuWeather Global Weather Center — March 15, 2018 — One storm will first track out of the Rockies and into the Midwest early next week. Next, during the middle to latter part of next week, a new storm will then form along the Atlantic coast and track northeastward. However, there appear to be some differences in the jet stream pattern next week, compared to the bulk of the storms from earlier in March. These differences may prevent the storm from being worse than average or becoming a bomb cyclone. The most significant difference is that the jet stream during the first part of next week may progress enough allow the Midwest storm to push farther to the north and east and remain the stronger of the two storms for a longer period. This stronger, longer Midwest storm scenario may allow milder air to push farther to the north and east and eventually result in more rain or little accumulation from a slushy rain/wet snow mix for more places, when compared to the March 12-13 nor’easter. However, there will be plenty of fresh cold air from the Great Lakes to the upper mid-Atlantic and New England to promote at least some snow during the storm. Indications are that a storm will affect areas from the Midwest to the Northeast next week, but the strength and magnitude of the impacts are uncertain. Even with a storm of average intensity, there are still likely to be significant, negative impacts on travel and daily activities. An intense storm is not needed to bring a foot of snow to some locations, especially over interior locations. Airline passengers should expect flight delays to increase as next week progresses with possible flight cancellations. The commute on one or two days next week may be hampered by wet or wintry precipitation. Enough snow may fall to cause school delays, early dismissals or postponement of classes entirely. Even if the Midwest storm has the upper hand, there may still be enough snow to shovel and plow from parts of the Ohio Valley and lower Great Lakes to the central Appalachians and New England. 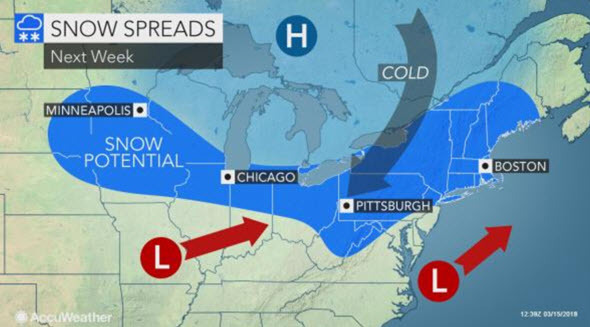 There is a chance of snow from Minneapolis to Chicago, Pittsburgh, New York City and Boston. However, it may be a matter of timing for any accumulation on roads in this swath with the storm next week. As many people have noticed, it must snow very hard during the day to accumulate on streets and highways in urban areas during March. Because of the complex nature of the storm, the exact timing of the heaviest precipitation, day versus night, may not be revealed until late this weekend in the Midwest and early next week in the Northeast. In terms of the strength of the wind and extent of power outages and coastal flooding, there is a risk of strong enough winds to cause more problems with this storm from the upper part of the mid-Atlantic coast through New England. How significant the problems are will depend on how much and how quickly the coastal storm develops. If the coastal storm is slow to develop and waits until it reaches the Maine coast, much of the region may be spared the worst of the wind and tidal problems. If the coastal storm strengthens quickly and takes over as the main storm at a fast pace, then it is more likely to tap the cold air sitting nearby to the north and bring more of a substantial wind and snow event for New England and perhaps the upper mid-Atlantic region. This quick development would be in response to a similar jet stream setup that reverts to the prior storms during March. Regardless, the timing of this storm will be out of sync with the new moon, which is this weekend. Astronomical tides are higher within a couple of days of the new and full moon. AccuWeather will continue to provide updates on the storm strength, track and timing in the coming days.